Well, the answer could well be an Energy Monitor. This device connects to the mains electrical supply of the house and displays on a monitor screen the actually electricity that is being used by the property at that moment in time. The device can be fixed to a wall or handheld, allowing you to take it with you around the property to keep an eye on your energy use. In addition to your current usage the monitors also allow you to recall and observe historical data of power consumption on a daily, weekly or even monthly basis. In this way this device allows you to not only recognise how much electricity that you are currently using at any time and to work out ways of managing your usage, such as which appliances use the most power and eliminate or reduce usage accordingly. It will also allow you to compare your usage over time to show graphically what reductions you have made. 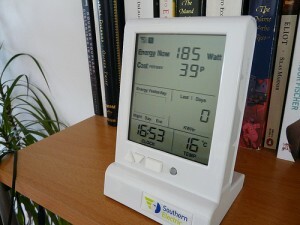 Energy Monitors shouldn’t be confused with Electricity Meters themselves, or with Smart Meters or Pre Payment meters. The Energy Monitor is not another form of meter and doesn’t report ratings or readings back to your utility supplier. It is an independent device for your own usage. There are many different suppliers and models of monitor out there, so make sure you do your research and find the right one for you. ; they currently have a discounted EAGA model. Amazon hold a good range of meters including the popular wireless OWL ranges. You can currently buy from Amazon the new OWL Micro + 2 II Energy Monitor CM180 Wireless Electricity Usage Smart Meter, New!!! You can sometimes get them through your utility provider for free, but always make sure to read the small print. Some providers might charge for the service, add the cost to the bill, or charge you if you decide to leave the tariff or provider. Just always check to see what you are agreeing to. The device on its own won’t save you money but what it will do is help you monitor what you actually use and more importantly make you aware of how much power you are using at any time. After a while it becomes a habit among Energy Monitor users to try to keep their power use as low as possible, to the point that one glance at the screen will tell them if something has been left on and to go switch it off! If you want to keep an eye on your utility usage, help to reduce your bills, and become more aware about your habits, then this is the perfect tool for you!